KLIMAdomotic is a smart control system optimized for radiant panel installations. It controls every element of indoor comfort through a single user interface, from heating to summer HVAC, passing through air exchange and humidity control. 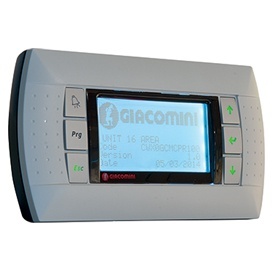 The user is connected 24/7 to his system thanks to the touch-screen control unit: easy to configure thanks to the user-friendly graphic interface, it can be controlled remotely with most Smartphones through the dedicated App “Giacomini Connect”. 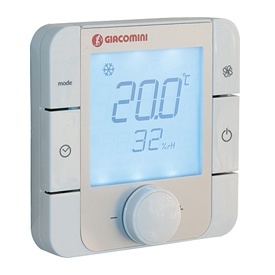 Family of chronothermostats and room thermostats with modern and technological aesthetics, offered both for external installation and built-in. They easily control radiant system in heating and cooling and can. 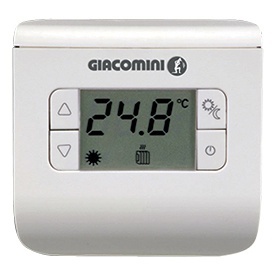 KLIMAdomotic is a multimedia device for remote control of heating, hot water and HVAC systems satisfying the requirements for the building energy efficiency tax relief.